Our hikes and lectures are free and open to the public, and all are welcome. (but we depend on our memberships to cover our expenses.) . Note: Home Tab above does not work correctly- fixed soon, I hope. photos- group photo (leader Bill Edwards middle, yellow shirt) , cut leaf toothwort , round leaf ragwort , early saxifrage flowers , early saxifrage plant , dwarf larkspur , true rue anemone , false rue anemone (always 5 petals, red stems) , yellow trout lily , dutchmans breeches , forest floor , Bill Edwards and Poppy . We're having an invasive removal & trail maintenance volunteer work day Saturday, April 13, 9 am - 12pm at California Woods, called Green Up Day. We have gloves and tools, and you're welcome to bring your own. (pruners, saws). 5400 Kellogg Ave, Cincinnati OH 45230, meeting at the main building down the park road from Kellogg. Thanks for your skillful help last Fall with the honeysuckles. I think you will enjoy driving in and not seeing any of it between the creek and the road. This is a good way to get to know one of Northside’s beautiful nature preserves and help to keep it beautiful. 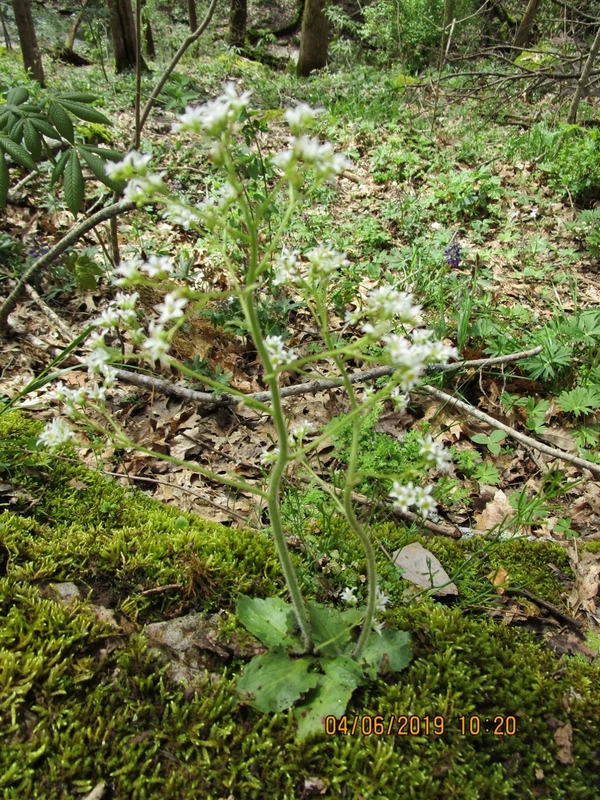 This process involves the removal of the invasive non-native Garlic Mustard. Come out and meet your neighbors. Children welcome. If you arrive after 10, take the trail and look for us (orange vests) working in that area. It should be a glorious day to be in the woods! Wildflowers will be blooming. Please wear gloves (thorns, poison ivy), kneeling mat if needed, trowels or something to dig with. Depending on how much rain we get on Friday, boots may be needed. 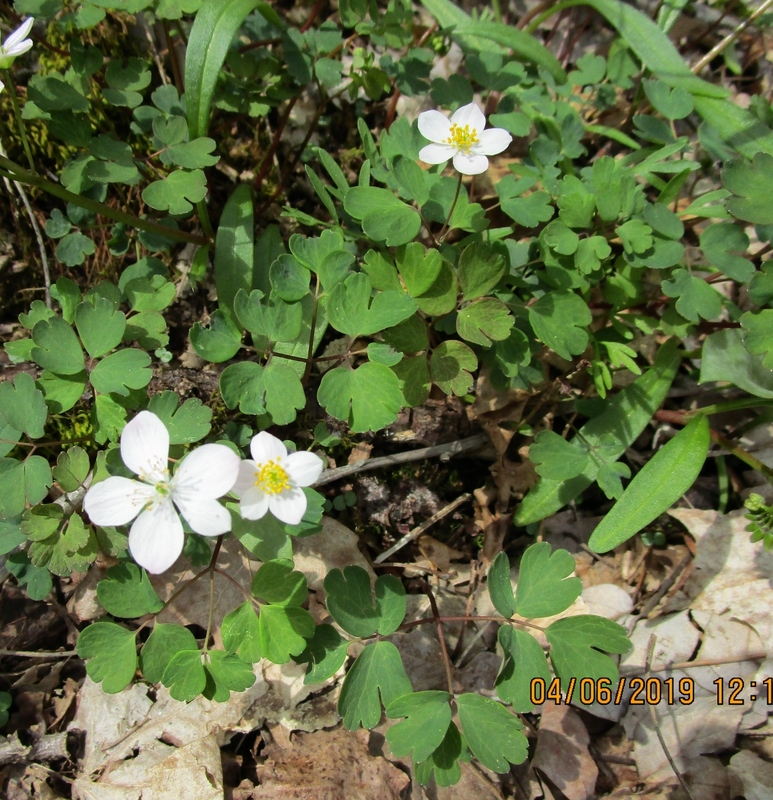 Join us for a guided hike to experience an outstanding display of wildflowers, streams, birds and woodlands at the Nature Conservancy’s Agnes Andreae Preserve near West Jefferson. 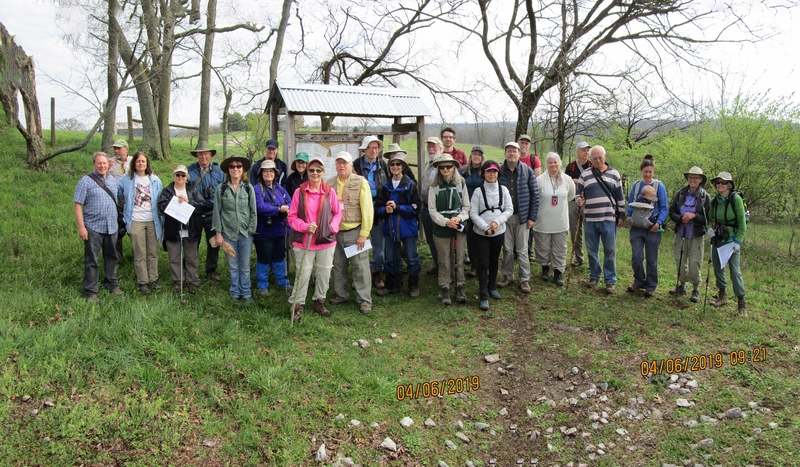 We have arranged for the hike to be led by the very knowledgeable Rick Gardner, ODNR chief botanist and Chris Rupp, TNC’s assistant preserve manager. Little Darby Creek was monitored by Ohio EPA in 2014 and was found to have some of the best stream quality in Ohio, including the area within the preserve. See the 2014 Dispatch article on this Preserve at http://www.dispatch.com/content/stories/science/2014/05/04/a-forest-unsullied.html. We expect to start at 10:00 AM and wander the preserve for a couple of hours. We may lunch out in the field, so bring a sack lunch and beverage with you. There is no set trail for the hike and at least one steep part that we may need to traverse, so we're saying this hike is semi-strenuous. Hike size will be limited to 20, so a RSVP is required. You can rsvp for others, please just give Angela Carter, amcarter@fuse.net, the names, your email and contact number. Agnes Andreae Preserve is approximately 2 hours from downtown Cincinnati; directions will be sent with rsvp. 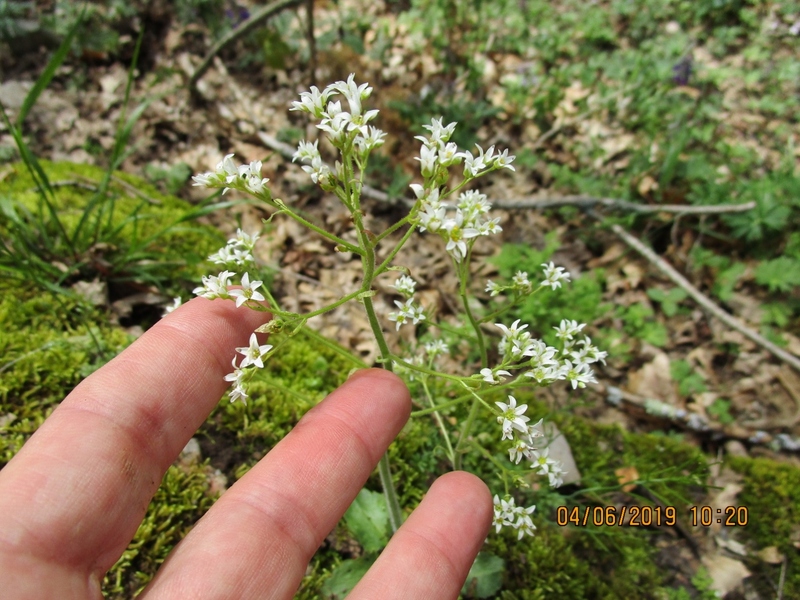 Angela Carter will lead us along Trillium Trail to a large population of shooting stars and numerous Spring ephemerals that we may find blooming along the trail. The reserve is located along the west bank of Indian Creek and part of a 135-acre scenic natural area comprised of wooded hillsides, wetlands, bluffs with rock outcroppings and bottom lands. Trails are considered moderate to difficult due to steps and steep inclines that are often muddy after rain as well as some tree roots exposed along the trail. The parking area is paved with access to a restroom and shelter. Contact Angela Carter (513-300-2787 or amcarter@fuse.net) if you have any questions. Directions: From Cincinnati, take I-275 to exit 33 for US-27/Colerain Ave/OH-126. Follow US-27 N for 10.8 miles and turn left onto Reily Millville Rd. After 6.2 miles, turn left onto OH-732 S/Main St that will become Springfield Rd after 0.2 miles. 6500 Springfield Rd is an additional 0.4 miles on your right. We are in for a treat as Bill Lindauer and friends lead us through Hisey Park! Hisey Park is a 158-acre Warren County Park located along the Little Miami River and Scenic River Bike Trail at 5443 Middletown Road directly south of Waynesville. In 2003, Ben Hisey sold the farm to the Warren County Parks hoping it would stay a farm. Continuing that tradition, Bill is raising corn, pumpkins and sunflowers for activities at the Hisey Fall Festival. Also, a tree nursery/arboretum is used to plant native trees and shrubs around Hisey. 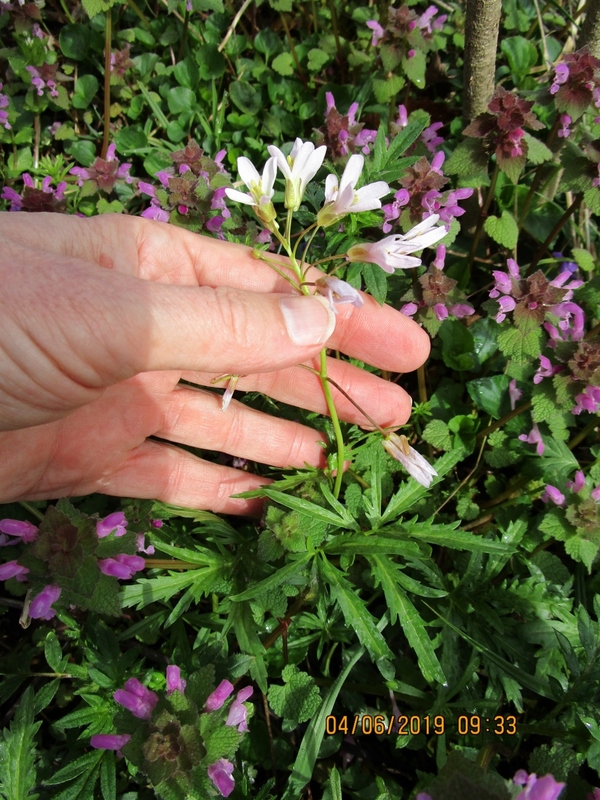 We also nurture & plant native wildflowers. There is a wetland in the NW corner of the farm. It contains swamp rose mallow, monkey flower, false daisy, water plantain, boneset, tall thoroughwort, buttonbush, winterberry holly and nannyberry. There are also numerous sycamore, cottonwood, swamp white oak, elm, silver maple, box elder, red maple, and speckled alder. There is a meadow with numerous mowed trails south of the wetlands. It has beautiful stands of wild bergamot and a rather interesting unknown wild blackberry. There is a bluebird trail through this area. The meadow is hunted by northern harriers, short eared owls, red-tails & other raptors. At our GBBC event we have called screech, barred, and great horned owls, and coyotes! We have watched eagles soaring, hawks arguing over prey, pileated woodpeckers eating suet, and yellow-bellied sapsuckers making their sap lines. The farm also attracts migratory birds like sand hill cranes and the black and white warbler. On various summer hikes, we have marveled at the Cooper’s hawk flight approach to its nest, the wonderful dance and mating flight of the American woodcock, black vulture chicks being raised in the hollow of a huge ash tree, and the red fox prints in the snow. There is an eroded, steep bluff rising eastward near the center of the farm. Near its north end is a scenic overlook and picnic area. At the northeast corner of the farm is an older forest, a stream, and upland areas At the southeast upland section of the farm the Hisey family planted many hardwoods. This whole area has an abundance of wildflowers blooming through spring summer and fall. 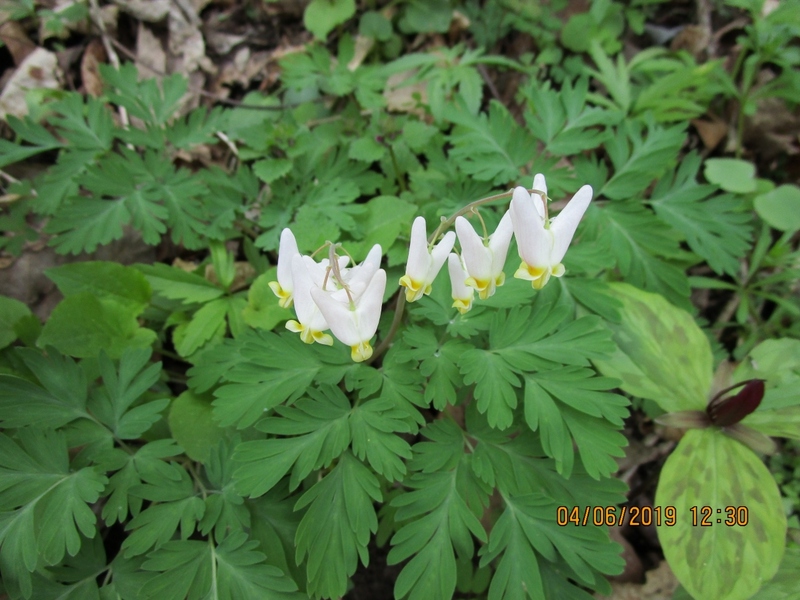 In spring can be found harbinger of spring, cut-leaf toothwort, spring beauty, yellow corydalis, yellow & white trout lily, twinleaf, May apple, purple phlox, hepatica, dwarf larkspur, bloodroot, Miami mist, corn salad, waterleaf, purple cress, purple rocket, lopseed, enchanter’s nightshade, jewelweed, toad shade, doll’s eyes, wild senna, tall bellflower, numerous ferns, mushrooms and more. Those wishing to continue exploring the area will travel to Caesar Creek State Nature Preserve (where we will have a Give Back Days next week to remove invasive honeysuckle). Be sure to pack a lunch and bring a water bottle. Contact Christine Hadley (513-850-9585 or christinehadley@earthlink.net) or Angela Carter (513-300-2787 or amcarter@fuse.net) if you have any questions. Directions: From Cincinnati, take I-71 N to exit 28 to merge onto OH-48 N toward Lebanon for 3.5 mile. After 1.3 miles, turn right onto Middletown Rd that winds to the left and becomes N Waynesville Rd. After 0.7 miles turn right onto Middletown Rd and turn left after 0.2 miles onto Corwin Rd. Turn right onto Middletown Rd. after 0.3 miles and the entrance to the park, 5443 Middletown Rd, Waynesville, OH 45068, will be on the right after 0.1 miles. 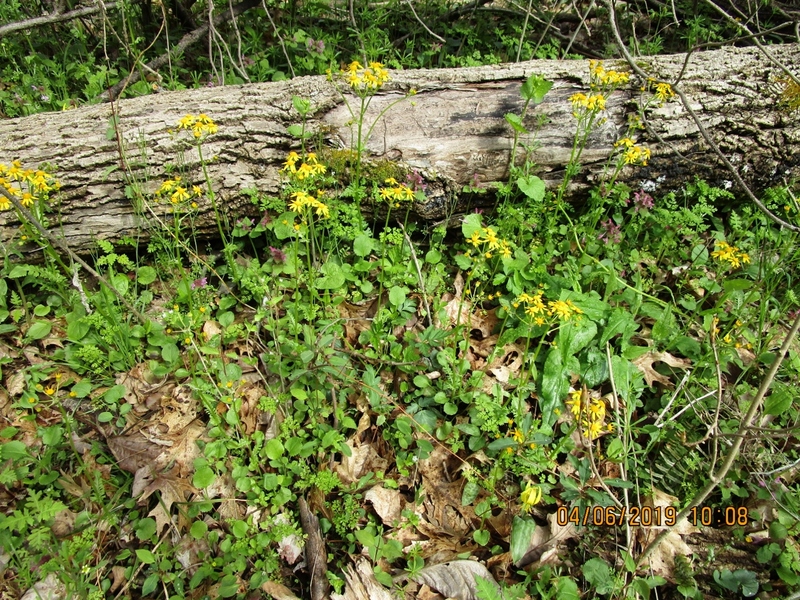 Join us to pull the invasive garlic mustard plant, which is easy to recognize and yank out of the ground. We want to help conserve DNAP's (Ohio Division of Natural Areas and Preserves) limited resources and preserve this lovely area where so much work has already been done on the bush honeysuckle. Bring gloves and enthusiasm. We'll furnish bags. No experience necessary! 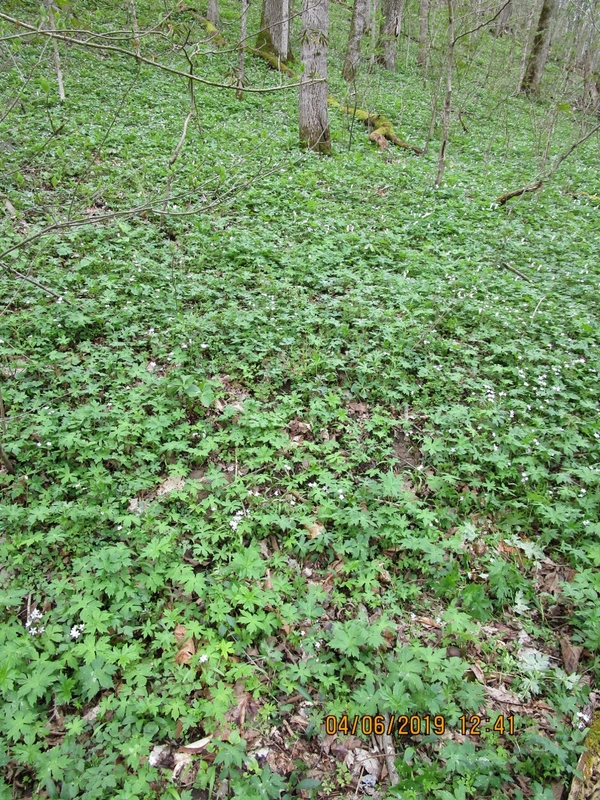 Of course, you can relax and take a nice walk after pulling garlic mustard, and we often have lunch at a local café. 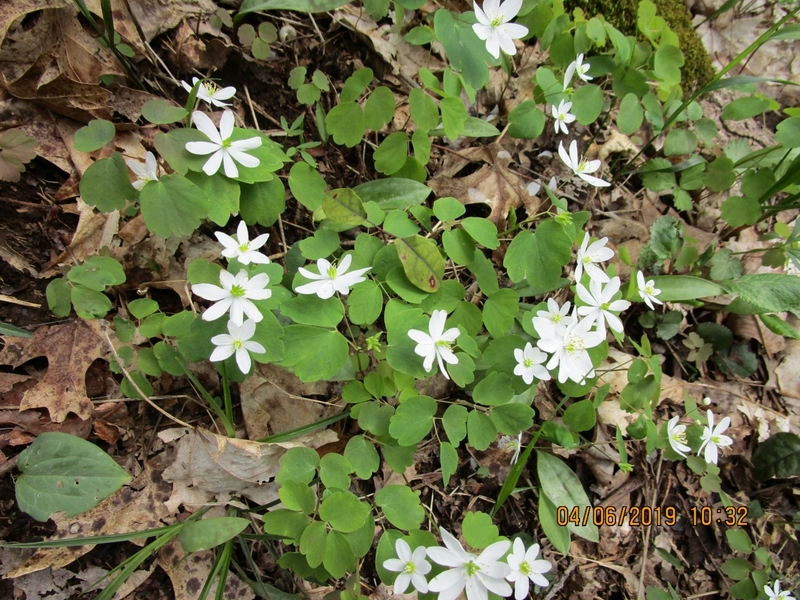 Caesar Creek Gorge is a wonderful preserve of 461 acres with a variety of spring ephemerals. The gorge walls, rising 180 feet above the river, were formed by glacial meltwater, exposing Ordovician limestone and shale rich in fossils. The preserve contains diverse habitat, including floodplain and hillsides heavily wooded with beech, maple, hickory, and oak. Note that we will be working at the Caesar Creek GORGE STATE NATURE PRESERVE on Corwin Road (and NOT the nearby Caesar Creek STATE PARK). Contact Christine Hadley at 513-850-9585 or christinehadley@earthlink.net if you have any questions. Directions: According to Google maps, the approximate address is 4250 Corwin Road, Waynesville, Ohio, 45054 or you may type in "Caesar Creek Gorge State Nature Preserve" as your destination. The Preserve is located about 55 minutes (or 45, if traffic is good) from downtown Cincinnati. From Cincinnati, take I-71 north to the Wilmington Road exit (exit 36). At the end of the exit ramp turn left (West) onto Wilmington Road. Travel for 1.7 miles on Wilmington Road down the steep hill, into the river valley. At this point, stay on Corwin Road, which follows along the east side of the Little Miami River. (DO NOT turn left, which continues as Wilmington Road and crosses the river). Approaching the town of Oregonia, jog right, then a quick left to stay on Corwin Road, passing where the post office and Hall’s Market used to be. Drive another 3 miles north of Oregonia. The preserve (and parking lot) will be on your right, the east side of the road. Meet in the parking lot. 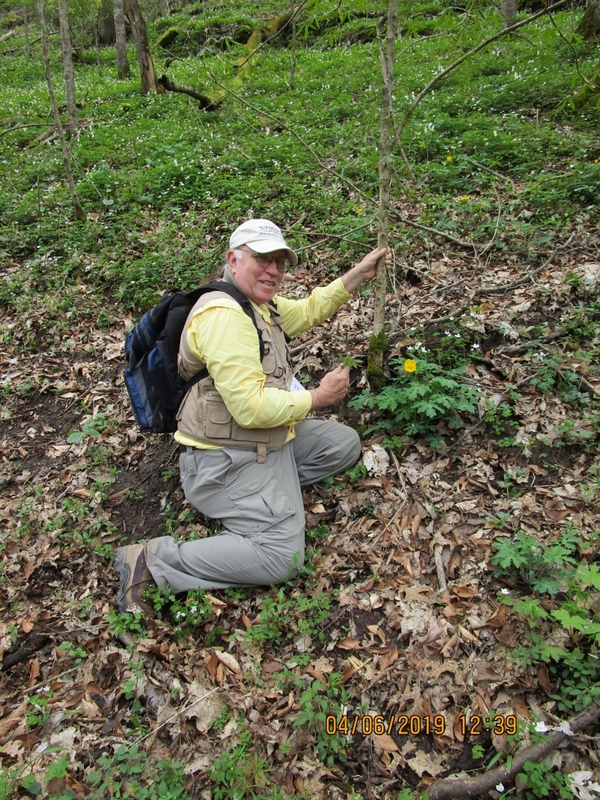 Dr. Jim Bissell, Curator of Botany and Director of Natural Areas for the Cleveland Museum of Natural History, will lead our trip through the 50-acre Scheele Preserve with the only rock elm (Ulmus thomasii) on Kelleys Island, Alvar Cliffs on the north side of the Museum's 21-acre Long Point Preserve on the island and the newest Cleveland Museum of Natural History preserve, 25 acres west of the Kelleys Island Glacial Grooves and Kelleys Island State Park Alvar Preserve. The 25 acres includes wave-splashed Alvar cliffs along the northern shoreline of Kelleys Island and some of the most spectacular Alvar opening on Kelleys Island. There are several hundred lakeside daisies, tussock sedge (Carex stricta), northern ragwort (Pachera paupercula), outstanding buttonbush (Cephalanthus occidentalis) ponds and golden fruited sedge (Carex aurea) and patches of big bluestem (Andropogon geradi)-indian grass (Sorghastrum nutans) prairie. The forest along the western edge of the 25-acre tract is dominated by hackberry (Celtis occidentalis), yellow oak (Quercus muhlenberii), blue ash (Fraxinus quadrangulata), black maple (Acer nigrum) with a local stand of Kentucky coffee tree (Gymnocladus dioicus) and blue ash (Fraxinus quadrangulata). The Alvar wave-splash cliffs along the Lake Erie shoreline is dominated by ninebark (Physocarpus opulifolius) and basswood (Tilia Americana). With special permission we also hope to see the only smooth rose (Rosa blanda) stand on limestone cliffs above the Alvar flats. Be sure to pack a lunch and bring a water bottle. Contact Christine Hadley (513-850-9585 or christinehadley@earthlink.net) or Angela Carter (513-300-2787 or amcarter@fuse.net) to let us know if you will be attending or if you have any questions. If you would like to carpool, please let us know in what area of town you are located, and we can try to help arrange rideshare. Please plan on arriving early by 10:40am at the parking lot for Marblehead Lighthouse State Park on 110 Lighthouse Dr, Marblehead, OH 43440 so that we may catch the 11am ferry to Kelleys Island. A few members have planned to stay on the island overnight on Friday. Directions: From Cincinnati, take I-75 North to exit 179, US-6 E in Center Township. Continue on US-6 E for 3.7 miles to OH-53 N. Take exit 101 to merge onto OH-53 N for 0.4 miles then follow OH-2 E/OH-53 N in Bay Township for 12.7 miles. Follow OH-2 E for 7.2 miles to exit 125A-B for OH-269 N in Danbury Township. Follow OH-269 N and W State Rte 163 E for 8.7 miles to Lighthouse Dr in Lakeside Marblehead. Please allow a minimum of 3.75 hrs. travel time from Cincinnati. 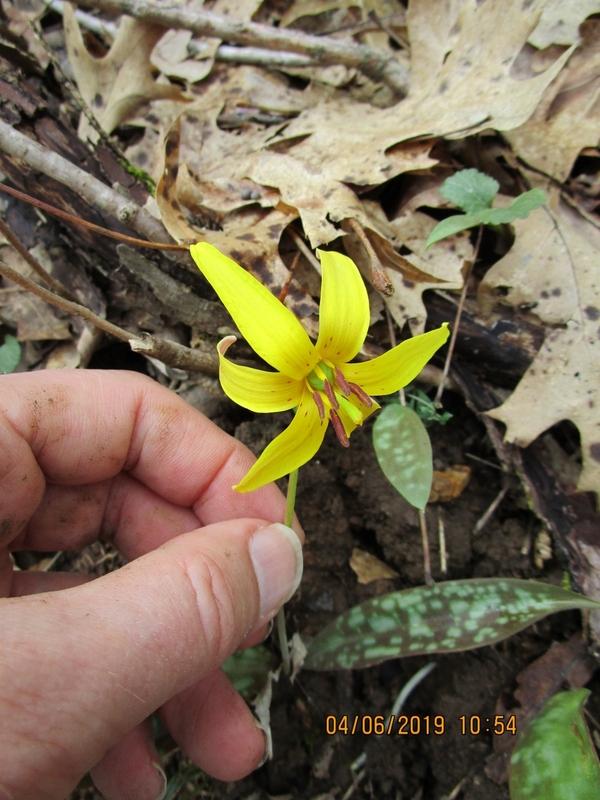 Friday September 6, 2019 – Photo Sharing Program at Avon Woods Nature Center, Hamilton County – Note: date for this meeting is one week earlier than usual. All of our events are free and open to the public. Of course if you enjoy our events, as we think you will, it is nice to join to help support the Society. Our hikes and lectures are excellent, in a wonderful casual atmosphere. You will have the opportunity to talk with our speakers after the meetings. 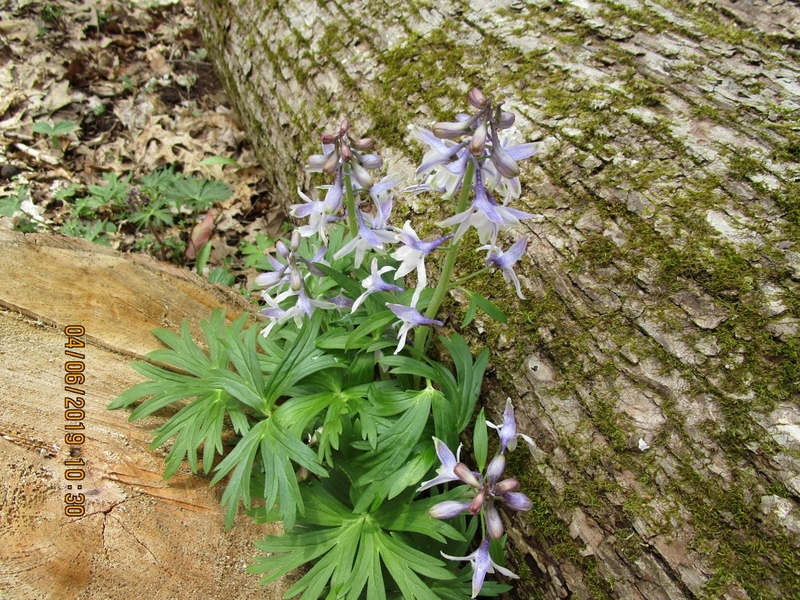 Our hike leaders are knowledgeable and will be glad to point out the plants that we are seeing. Cincinnati Wildflower Preservation Society, Ohio Native Plant Society , SW Ohio Chapter, Come Learn about Cincinnati and Ohio Native Plants. If tabs don't work, try these. Questions about events, lost going to an event, need e-mail reminders of events?